The U.S. economy weathered the federal budget cuts, and accelerated slightly in the second quarter. Gross domestic product -- the broadest measure of economic activity -- rose at a 1.7% annual rate in April through June, slightly faster than the 1.1% rate in the first quarter, the Bureau of Economic Analysis reported Wednesday. Federal budget cuts continued to drag on the economy, but the impact was not quite as severe as in prior months. According to the report, the U.S. economy took a major hit from the federal government in the last three months of 2012, when a drop in defense spending alone was deep enough to subtract a full percentage point from economic growth. In contrast, government cuts in areas other than defense started dragging on the economy in the first quarter but have subtracted only about a tenth of a percentage point from GDP growth. Economists are expecting the impact from government cuts to wane in the months ahead. "In general, the drag from fiscal policy is likely to fade over the next few quarters," said Jim O'Sullivan, chief U.S. economist for High Frequency Economics. He predicts GDP will grow at a 3% annual rate in the second half of the year. Consumer spending continued to rise in the second quarter, as Americans spent more on health care, recreational goods and vehicles, furnishings and clothing. The gain was slightly slower than in the first three months of the year, but was still seen as a good sign that consumers are coping well in spite of a higher payroll tax rate this year. Meanwhile, business investment and the housing recovery also boosted growth. Economists surveyed by CNNMoney had predicted GDP would grow at a 1.2% annual pace, so the report was better than expected and seen as an encouraging sign for the recovery. That said, 1.7% growth is still considered weak historically. Since 1929, the U.S. economy has grown an average of 3.3% per year. "With this report, the story of modest growth just continues on," said Jason Schenker, president and chief economist of Prestige Economics. The Bureau of Economic Analysis also revised its GDP methodology on Wednesday to include research and development and arts and entertainment production as business investments. The new methodology means U.S. economic output is larger than previously reported, at around $16.6 trillion a year. Revisions also show the 12 months leading up to April were weaker than previously reported. 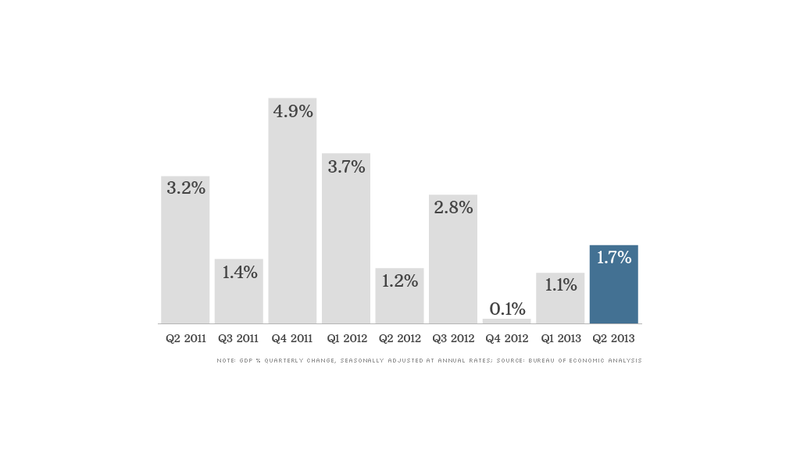 In the first quarter of 2013, the economy grew at only a 1.1% annual pace, down from the 1.8% previously reported, and in the fourth quarter of 2012, the economy was near a standstill, growing at only a 0.1% rate. Related: Bernanke: Tapering plan not a "preset course"
Hours after the GDP report, the Federal Reserve released its latest policy statement, indicating little change in its economic outlook. The central bank characterized economic growth as "modest" and said it expects "economic growth will pick up from its recent pace." The central bank is currently engaged in a controversial stimulus policy, known as QE3, in which it buys $85 billion a month in Treasuries and mortgage-backed securities. Fed Chairman Ben Bernanke has said the economic data will determine when the Fed is ready to start reducing those purchases. The central bank refrained from issuing a timeline in its policy statement Wednesday.